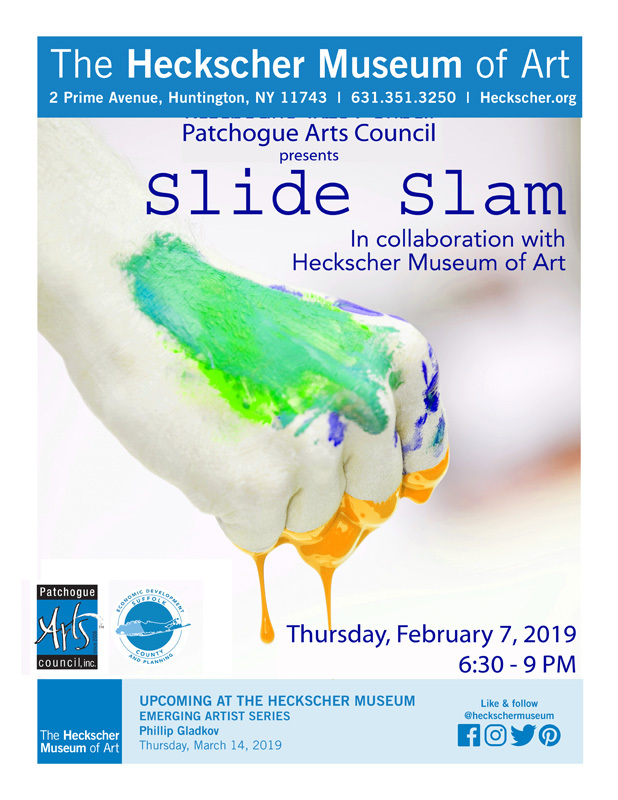 I will talk [5 minutes] about my work, debacle 2015-2016, in the Patchogue Arts Council’s Slide Slam, on Thursday, February 7th from 6:30 PM to 9 PM hosted by the Heckscher Museum of Art in Nassau, Long Island, NY. This exciting evening features selected artists presenting their work for 5 minutes each. Artists then network with special guests including curators and art professionals seeking new artists to work with. This program is part of PAC’s 2018-2019 imPACtful connections: Island wide networking for creatives and supported in-part with public funding provided by Suffolk County. Slide Slam Artists: James Byrne, Michael Chait, Karine Falleni, Holly Gordon, Adel Gorgy, Takafumi Ide, Ianthe Jackson, Michael Krasowitz, Jamie Mareno, Martha Mcaleer, Kelsey McKeon, Minoo Moadel, Noriko Okada, Andreas Rentsch, and Lydia Rivera. This project was made possible with the generous support of the Stony Brook Graduate Student Organization (GSO). 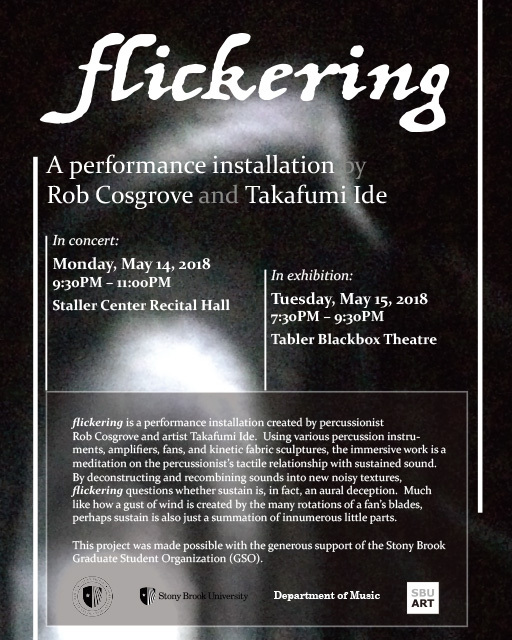 flickering is a performance installation created by percussionist Rob Cosgrove and artist Takafumi Ide. Using various percussion instruments, amplifiers, fans, and kinetic fabric sculptures, the immersive work is a meditation on the percussionist’s tactile relationship with sustained sound. By deconstructing and recombining sounds into new noisy textures, flickering questions whether sustain is, in fact, an aural deception. Much like how a gust of wind is created by the many rotations of a fan’s blades, perhaps sustain is also just a summation of innumerous little parts. I will have two major exhibitions, which are the compilations of my activities this summer. The first one is Nakanojo Biennale 2017, which is already open until October 9th. 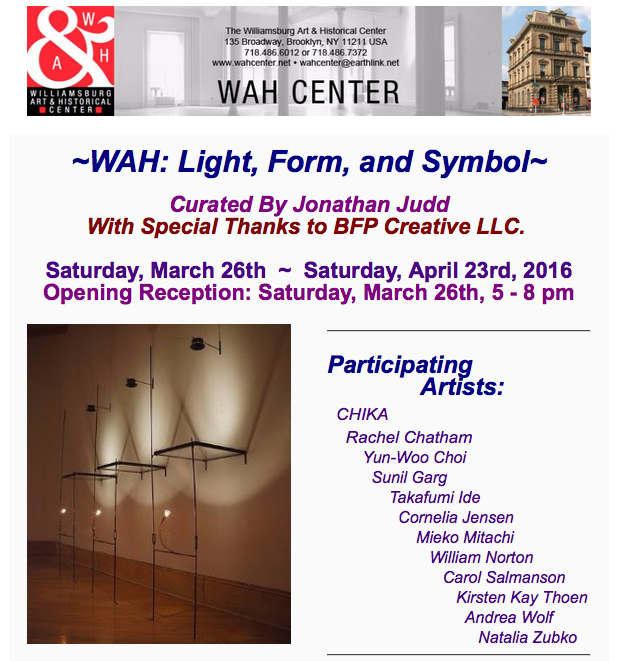 Another one is a group exhibition at Wave Hill in Bronx, NY. I have two sound works. The first one I use a parametric speaker. The second one I use a pair of headphone with binaural sound effect. Both of them are site-specific artworks. Hope people can come to listen them on the site. Opening reception will be tomorrow(9/10) at 2pm / Free with admission to the grounds. I finally finished to install my work “debacle, 2015” in Abrons Arts Center (466 Grand St. NY NY). 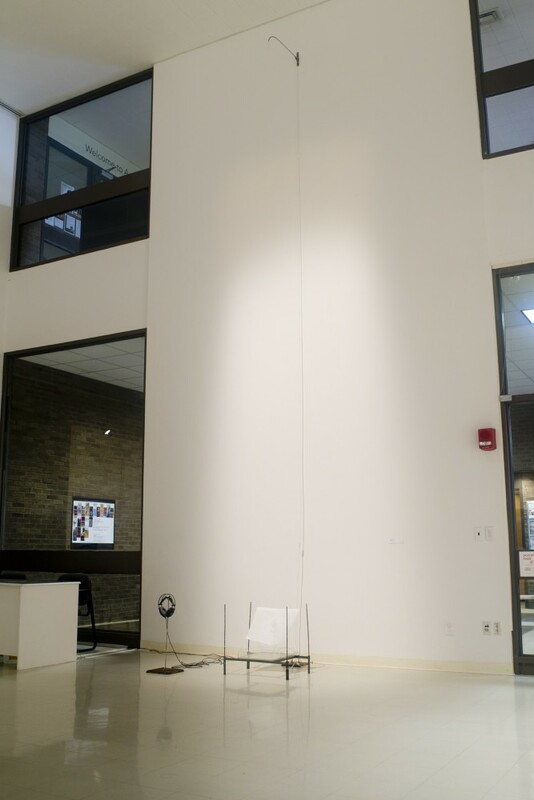 It is a sculptural sound installation with PureData w/Arduino/sensor. The work has been selected to exhibit at New York City Electroacoustic Music Festival 2016, which opens from today June 13 to June 19. The entry fee for the installation exhibition is free and opens from 10am to 10:30pm. My two drawings have been showing in this juried exhibition. IAM Pocket Sized invited artists from around the world to create art that fits in the palm of your hand! 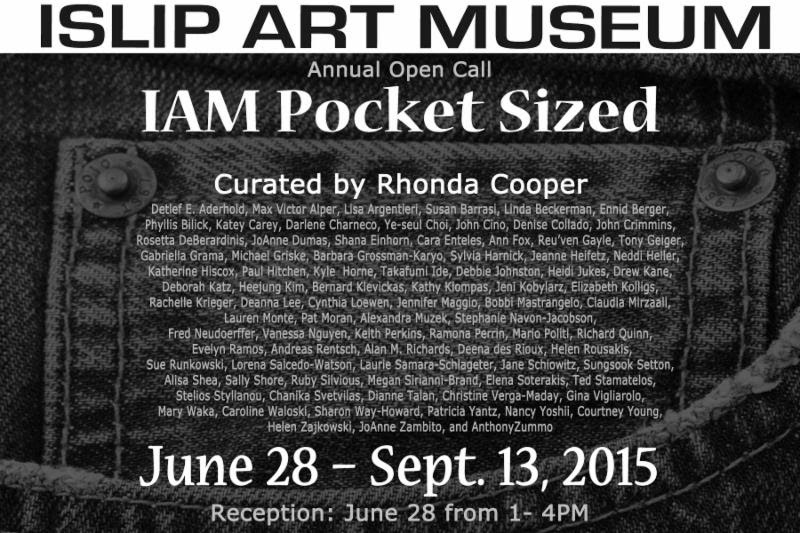 I AM Pocket Sized exhibits a large survey of paintings, drawings, collages, sculpture, and more. In today’s art world, where the notion that bigger is better seems to be too-often taken for granted, it’s refreshing to see that contemporary artists are continuing to produce work on a small scale as well. While small-scale paintings and sculptures, or maquettes, have often been produced as preliminary studies for larger-scale works, the artists represented in the IAM’s current exhibition demonstrate that small works hold a valid and unique place of their own in an art world often dominated by more sizable creations. 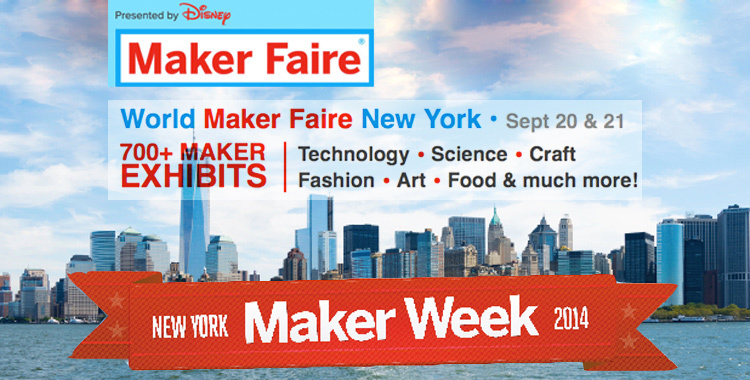 There are 700+ Maker Exhibits. Technology, Science, Craft, Fashion, Art, Food & much more!